James Beverly’s Seamus Adventures NOW AVAILABLE Before Christmas on ITunes, Kindle, Nook, and Other Tablets! Child psychologist James Beverly now has his loveable Sheltie, Seamus, help parents and adults in Ebooks tackle the everyday challenges of guidance to growing up. Seamus is in EBooks now! Corinth, MS – Dec 16, 2011 – Are you a parent who is struggling with how to talk to your child? Just do not know how to approach certain topics like morals, death, or bullying? Here are some great books for you! Meet Seamus the Sheltie, a loveable dog who has humorous adventures while learning about the world around him. Written by child psychologist James Beverly, Mr. Beverly used the storytelling techniques of his grandfather, with the addition of animal language for Seamus, and a whopping does of humor to help the medicine go down! Having encountered many parents and children who needed help, Mr. Beverly was inspired to write these wonderful tales to assist those he cannot get to. Written to appeal to children, while dealing with subjects parents know must be addressed, Seamus the Sheltie is a definite read. The most recent book, SEAMUS THE SHELTIE TO THE RESCUE, was released in April of 2011. 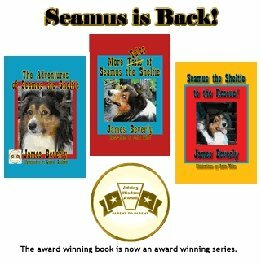 Now, all three books, THE ADVENTURES OF SEAMUS THE SHELTIE, and MORE TALES OF SEAMUS THE SHELTIE as well as SEAMUS THE SHELTIE TO THE RESCUE are available from the home site at //http://www.seamusthesheltie.com// as well as at Amazon.com. **Before Christmas, all of the Seamus books will be available on ITunes, Kindle, Nook, and other Tablets. You can download a Special Coloring Book when you visit and register on their site. Just click on over to Seamus the Sheltie, visit his Secret Place, and download a free coloring book! Do not delay! Go see Seamus in time for Christmas today! (openPR from James Beverly) – It cannot be disputed that electronic tablets can bring a myriad of wonderful things into the lives of our children. They can offer children a wide variety of excellent early learning programs that are complete with well designed reinforcement displays. They can be wonderful additions to any family. But if parents and grandparents do not exercise good judgment, they can be a subtle thief that can rob children of many important family experiences. Where to start: First of all, select a book or story that has something in it that can be discussed. This may not be as easy as it sounds. Most children’s books are basically cute images with little or no substance. Beverly believes that reading to your child from their own book is a wonderful bonding experience that teaches so many meaningful things and opens the door for real conversations about important issues. Trust in talking to you about difficult subjects happens. Learning to listen and feeling safe to ask you questions are critical events to a child’s learning and feeling of acceptance and safety. What is important is that your child can have your undivided attention and feel comfortable talking about what is on his or her mind. James Beverly is the author of the ‘Seamus the Sheltie’ series of children’s books. The books are available at Amazon.com, Barnes and Noble, Itunes, most bookstores and at Mr. Beverly’s website. Mr. Beverly recently appeared on The Children’s Authors Show. The interview is available at his website. Mr. Beverly is available for media interviews and can be reached using the information below or by email at dulcjlb@wildblue.net. More information (including some secret places for kids) can be found at his website. James Beverly received his Bachelor of Science degree from Wayne State University and his Master of Arts degree in Clinical Child Psychology from the University of Waterloo in Waterloo Ontario, Canada. He was then invited by Dr. John Basmajian, the Dean of the Medical School at Queen’s University, to join his research team. James spent the next two years enrolled in the Medical School at Queen’s University in Kingston Ontario where he was involved in research projects involving physically handicapped children. Since then James has worked in the field of mental health as a therapist and administrator in nine states for over forty five years. He has presented at a number of national and state conferences and he has been nominated for a variety of state and regional awards for innovative clinical programming. James retired in 2010. During his many years of service, James worked directly with a wide variety of distressed children and their families in a variety of institutional and community settings. During this time, James became acutely aware of the poor communication that existed in many of the families, which led to a lack of meaningful family values being instilled in the children. It was apparent to James that there were very little written or easily available materials available for parents and children to assist in these tasks. These experiences laid the foundation for a series of books for children and their parents that was designed specifically to fill these values and communication gaps in a pleasant, fun, and non-threatening manner. Following the success of his nationally award-winning book ‘The Adventures of Seamus the Sheltie’, James continued to receive many requests from parents asking if he would please write additional stories for them that would deal with some specific and difficult topics that they were having problems with trying to discuss them with their child. These requests led James to the publication of his two most recent books, ‘More Tales of Seamus the Sheltie’, and ‘Seamus the Sheltie to the Rescue’.